He would have been 74 today. And although he has been dead for over 20 years now, and even the circumstances surrounding his death (such as where he died, and his last concert in Amsterdam) are getting blurred* in the mist of time, he remains a legend, a source of inspiration both for musicians and for the many, many, many passionate lovers of his music and of the passion and assertiveness of his guitar playing. And I count myself amongst those. Of course I don't need an excuse to post another album by Franco and his orchestre O.K. Jazz. And especially when it concerns this one. 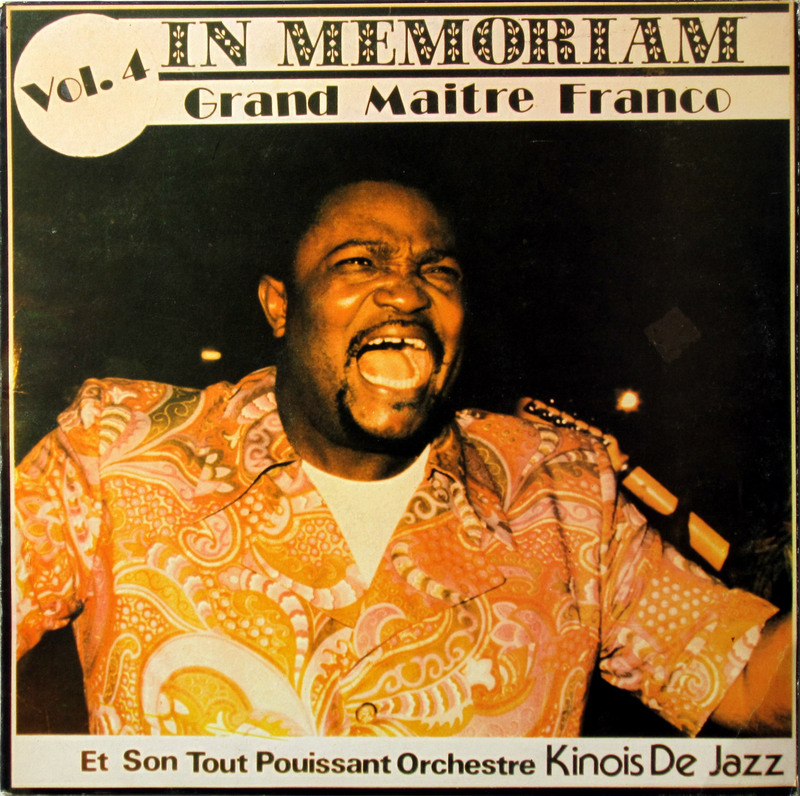 Volume 4 is from the In Memoriam series released by Polygram, Kenya in 1989, shortly after Franco's death. This album contains a truly varied selection of songs from the early 1970s/late 1960s. Four of the eight songs are composed by Franco himself, and one each by Kwamy, Youlou, Celi Bitshou and Vicky. Franco is at it from the start, with some trademark shuffles in the opening track "Claude" and over 2 minutes of unadulterated 'mipanza' (or 'knitting'), as Franco would call his guitar style. More ecstacy in the third track "Caisse D'Epargne". I suspect the song is about a savings bank, but the music can certainly not be labelled as 'frugal', let alone dull. This is one of the very few songs in this period featuring a drum kit. The O.K. Jazz used a drum kit in their live performances but found it hard to use in the studio. The reason is quite obvious, given that recordings were done in one take. The - skipping - result in this song is quite satisfactory, but only because Franco's contribution on guitar is minimal. Chécain's voice seems to act as a counterpoise for the jubilant horns. Please note, by the way, that Kwamy's last whispers at the very end of the song are missing in the CD version (Sonodisc CD 36603). Like "Lola" the tracks on side B can be found on CD's. In the case of Youlou Mabiala's "Celina" this is actually an improvement as the version on CD 36586 is in stereo and (subsequently) sounds more open. "Patience" was released on CD 36581 as "Mwasi Tata Abali Sika". In the case of "Mokili Matata" the CD version is even harder to trace, as it is credited on the CD (the same as the previous track) to Franco. This is incorrect. It is wise to take good note of all tracks composed by Celi Bitshou. His best known composition is of course "(Infidelité) Mado", but other tracks like "Mokolo Ya Pasi" and "Nazali Kitoko Mingi" (on that great CD 36514) show his incredible talent for arranging and for the dramatic. And the same goes for this "Mokili Matata". Franco's rhythmic interaction with the percussion and the rhythm guitar is - again - brilliant. The last track is really an 'odd one out'. The song was recorded as the very first song of Vicky's Viclong label. As such it was the first step on the way to the separation between Franco and Vicky, with as you may remember from this earlier post a B-side entitled "J'ai trompé mon amour". An indication of things to come, one might say. And as an extra celebrational bonus I am adding this incredible video, posted by Aboubacar Siddikh. On-topic: You may remember my earlier post dedicate to the legendary Siramori Diabaté. 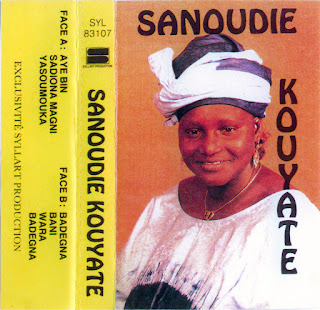 In this post I would like to share with you some recordings made by her eldest daughter, Sanoudie (or Sanungwe or Sanougue) Kouyaté. Perhaps you know her 1990 "Balendala Djibe" album (cassette/lp/CD) which was produced by Salif Keita and recorded in Paris. As far as I know she has not brought out another record since, although I think I saw the title song of the Paris recording on one of the many CD compilation of Malian divas. I am not sure about her present role in Malian music, but I gather from a book entitled "Relaties smeden: de rol van een jelimuso (griotte) in Mali" (i.e. 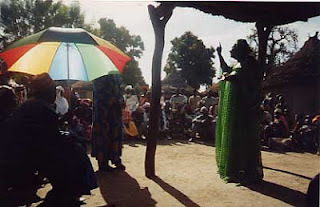 "Forging relationships: the role of a jelimuso [female griot] in Mali") written by Dutch antropologist Nienke Muurling (and released in 2003), in which the writer submerges into the jeli scene of Bamako & Paris, that Sanoudie was very much active in the lucrative sumu (soirées, weddings, baptisms and such) scene at the turn of the century. Apparently (I read in this same book) she wasn't able to follow in the footsteps of her mother until in the second part of the 1980s, not because of lack of talent or of 'griot training' (the practical side of tradition), but because of her marriage to a Diawara. Her husband's family did not allow her to get mixed up in 'jeli doings'.... It wasn't until she divorced Diawara and married Madusilla Kouyaté that she was able to start a career as a djeli mousso (jelimuso). Personally I am not a great fan of "Balendala Djibe". Like many of Salif Keita's albums it is too overproduced for my liking and - as a result - the music loses a lot of its power. Although Sanoudie manages - and with some ease - to overcome the treaclelike production, she has had to make some adjustments to do so. Especially the more subtle nuances of her voice are lost. These subtleties are very audible in this cassette, which is not dated but which I assume was recorded in the late 1980s. On this cassette she is very much her mother's daughter, and not just by the choice of songs. For all the songs are from Siramori Diabaté's repertoire, which is the repertoire of the griots of Kangaba/Kela (I gladly refer you to Jan Jansen's great CD's on the PAN label, no. 2015, 2059 and 2104). The accompaniment is simple and inobtrusive, especially on side B, where it consists of just a guitar (her husband Madusilla?). On side A there are brilliant renditions of Malinké classics like "Sadiona Magni" and "Yasoumouka" (which you perhaps know from the version by Les Ambassadeurs du Motel), but as great as these are, the killer tracks are, in my opinion, on the B-side. "Bani" (elsewhere interpreted under the title of "Baninde" - see this post and - of course - this one) is one of the best versions I have heard. And that classic of classics "Wara" is sung in a disturblingly casual but brilliant manner, - and hits me right between the eyes. There are several videos on YouTube by Sanoudie (don't look for Sanoudie, but try Sanungwe instead). My favourite of these is the one Ngoni posted on his great channel. It is roughly from the same period as the recordings on the cassette, and (also??) features her husband on guitar.